The aim of this study was to analyse the transfer of extreme price risk between selected EU milling wheat markets in the years 2005–2015. Extreme price risk (value at risk) was estimated using the ARMA-GARCH- -EVT models. 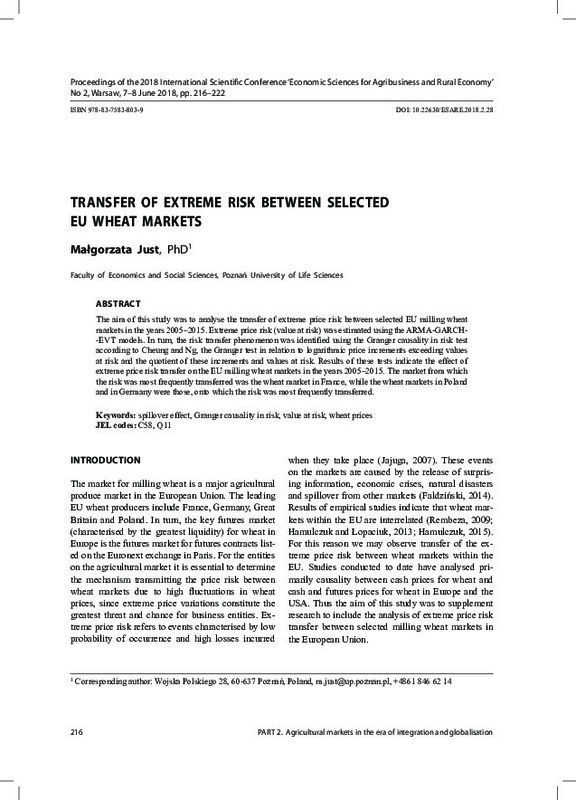 In turn, the risk transfer phenomenon was identified using the Granger causality in risk test according to Cheung and Ng, the Granger test in relation to logarithmic price increments exceeding values at risk and the quotient of these increments and values at risk. Results of these tests indicate the effect of extreme price risk transfer on the EU milling wheat markets in the years 2005–2015. The market from which the risk was most frequently transferred was the wheat market in France, while the wheat markets in Poland and in Germany were those, onto which the risk was most frequently transferred.